$3960 (1982) . . .
DC TO 200 MHz BANDWIDTH -- Conservatively rated, in the Tek tradition. DUAL TRACE - Chopped or alternately displayed. 5mV/DIV - 50V/DIV VERTICAL - Enough sensitivity to test microphones, and enough range for vacuum tube circuitry too. Also with Tek's good overload protection, it can handle sunstantial overvoltage without frying the inputs. 0.01USEC/DIV TO .5s/DIV HORIZONTAL - Speedy enough so you can watch short glitches. TIMES 10 SWEEP MAGNIFIER -- Even more expansion for watching extra closely. Dual sweeps, DELAYED or EXPANDED SWEEPS- Nice ten-turn knob so you can slide along the waveform at your leisure. TRIGGER VIEW-- Pull a knob and watch what the trigger circuit is seeing-- great for optimizing triggering levels and bandwidths. A cornucopia of triggering and sweep options! 8.10 cm CRT-- Big enough so those of us with old eyeballs can read it from across the room. Special note to young folks: If you're only using a digital scope, you're missing out. There's a whole underworld of little bits of noise, hum, and glitches that your digital scope is just glossing over. 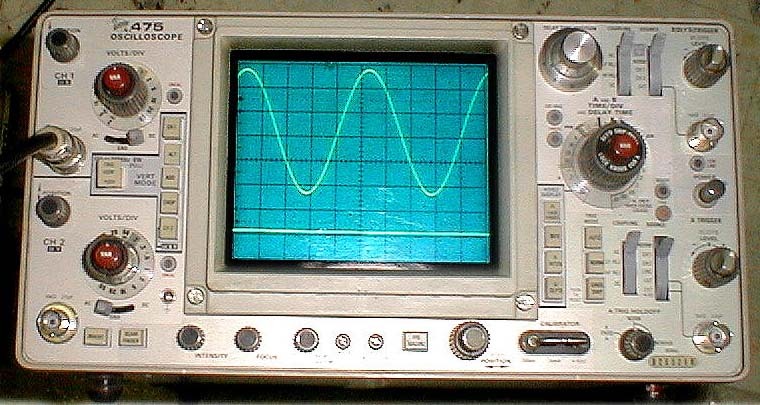 Get a real good analog scope for those times when your digital scope isnt giving you the amount of detail you need.